Height (you can approximate): 8"
Abilities: Kirby can inhale air and float like a balloon indefinitely; he can also inhale enemies, projectiles, and objects, and either spit them back out or swallow them to gain a Copy Ability. In addition to this, Kirby can kickslide, dodge roll, and block attacks. Bio: Kirby is the titular pink puff and main protagonist of Nintendo's Kirby series of video games. 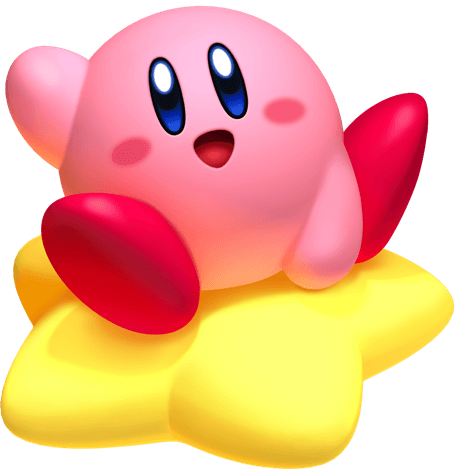 Kirby is largely innocent and has a cheerful demeanor and a positive attitude. He likes to help other people so much, sometimes he goes out of his way to do it; in the Dyna Blade sub-game of Kirby Super Star Ultra, he feeds Dyna Blade's chicks on his own (though expresses annoyance at Dyna Blade's chicks' constant noise-making before dragging them off to Whispy Woods to be fed by the constant dropped apples from the tree's branches) and teaches them how to fly. He has been shown to have a sense of justice, and won't spare someone who is a danger to those around him, as evidenced by his battles against final bosses. Throughout the many dangers he is put through, he is notably brave, maintaining a neutral expression almost constantly. This is especially evident in the Subspace Emissary. In the anime, he doesn't harbor dislike for anybody, in particular, not even King Dedede or Escargoon who mostly cause trouble for himself, and mostly greets everyone he meets. While he is brave and has a sense of justice, Kirby is quick to suspect King Dedede as the culprit for mischief, such as at the beginning of Kirby: Squeak Squad. In fact, Kirby has demonstrated a consistent impulsive streak throughout the series and can be as quick to start fights as he is to pass them by, fighting Dedede, Meta Knight and Dyna Blade on impulse. He also willingly responded to Dedede's call for a rematch and attacked Shadow Kirby without thinking. This recklessness can often lead him into trouble or cause him to create trouble (such as when he accidentally released Nightmare). Kirby never hesitates to help whenever Dream Land is in trouble, but when he doesn't have his work cut out for him doing that, he loves nothing more than eating and sleeping, especially during the day. Kirby's favorite food is tomatoes, Maxim Tomatoes in particular, and these fully restore his health in the games. In the anime where tomatoes are never seen growing, Kirby gorges on watermelons instead. Kirby's appetite for food is immense (but he does have his limits); he can eat whole tables' worth of food and still go on, and partially eat a cake as large as a mountain, as shown from a cutscene in Kirby's Epic Yarn, where he and Prince Fluff had an eating contest. While it is undeniable that Kirby adores eating, it is not certain whether he enjoys the act of eating or the taste of food. Kirby has preference over certain foods but he eats just about everything. In the anime, since Cappies know about this attribute of his, they invite him to dinner whenever they have leftover food, and Tuggle often gives whole piles of expired food for him to finish. While the Cappies do it for their convenience more than for Kirby's benefit, Kirby doesn't realize nor seem to mind, and the expired food doesn't do him any harm. Height (you can approximate): 5'5"
Abilities: Noire, as an Archer class, is skilled with a bow. She has two options for promotion: Bow Knight, and Sniper; the former of which puts her on a horse and gives her the ability to use swords, and the latter which improves her skill with the bow overall. She is equipped with a Killer Bow, which has a higher critical rate, and a Longbow, which has a longer range than a regular bow. She also knows how to make and repair arrows. - Vengeance, which powers up Noire's attack the more she is hurt. Bio: Noire is the daughter of Tharja. In the future, whenever Tharja developed a new curse, Noire was usually the unlucky test subject along with her father sometimes. She would dread these sessions with her mother and inversely loved whenever her father would stop Tharja's experiments to take her home. Noire became timid and meek as a result of many years of testing. To counteract this, Tharja developed a special talisman which created a much more brash and somewhat violent persona for Noire whenever she wore it. With the threat of Risen becoming too much, her parents committed to fighting off Risen and both died protecting Noire. Noire was given Tharja's wedding ring, which she wore from then on. Noire joined Lucina and the other children during their journey into the past to prevent the ruinous future. Being used as a guinea pig for her mother's curses during her childhood, Noire has developed a cowardly and negative personality, usually being too timid to voice any opinions and easily intimidated, with supports with Brady and Laurent revealing that she is anemic, tending to get fatigued easily and pass out as a result. However, seemingly due to a talisman from her mother, she has something of a split personality, with her other self acting more brash and aggressive and having no problem saying exactly what's on her mind while yelling, changing between both sides randomly mid-conversation and leaving others bewildered. However, in some cases it is implied that she herself developed her alternate personality as a coping mechanism. This is emphasized by the fact that she inherited some of the same obsessive traits as her mother (though nowhere near the same degree), as in her support with Inigo, she uses her bow to scare off women away from him. She dislikes having to rely on others because she does not wish to stay quiet and insecure, apologizing to Severa for needing her help for nearly everything in their supports, lamenting her fragile health to Brady, and tells Yarne in their talks that while she is terrified of battle, she doesn't want to lose anyone or be a burden, so she forces herself to fight. With her mother being emotionally distant and considerably abusive to her despite her father's attempts to protect her, Noire's relationship with her mother is strained, as she resents and lives in fear of her, and in her supports with the female Avatar, she will start latching onto her as a mother figure and outright states she thinks she'd make a way better mother than Tharja did. Despite this, Noire constantly tries to seek approval from her mother, going so far as to learn how to use Dark Magic in combat by copying her movements. Oddly, she seems to have a fixation for gold, as she often asks for it as gifts in her relationship event tiles. She is the fastest to escape in the army. 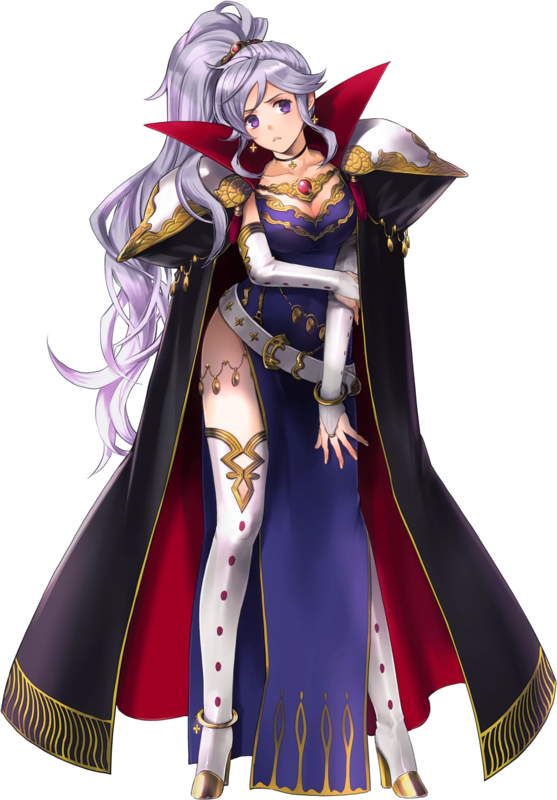 Abilities: Ishtar is known as the Thunder Goddess, and has the highest potency when using thunder magic. Her personal tome, Mjölnir, is able to call down intense lightning, and is able to strike with deadly critical accuracy. She can only use this tome because of the blood of Thrud that runs through her veins. In addition, she is equipped with a Barrier Ring, which makes her more resistant to magic, and a Life Bracelet, which restores her health every turn. Bio: Ishtar is a descendant of Thrud who has inherited the ability to use the Mjölnir. From her mother's side, she is a descendant of Fjalar. As a result of her immense power, Ishtar is known as the Goddess of Thunder. During her childhood, Reinhardt was assigned to be Ishtar's personal guard. While he became the first in command under her to the Gelben Ritter, she became a very powerful mage who is widely known for her skill with thunder magic. Despite her mother's cruel treatment of Tine/Linda, Ishtar did not treat her with disdain, and instead did her best to comfort her in her times of need. Some time before the Liberation War, Ishtar and the Imperial Prince Julius of Grannvale fell in love with each other. Her mother was very pleased with this relationship, as she wished to benefit from their union. After Julius received the Book of Loptous, he murdered his mother and tried to kill his sister, but his love for Ishtar never changed. Despite knowing what happened to him, she remained loyal to him and continued to love him. However, once he began performing the child hunts, she became shocked and attempted to convince him to stop. After Julius ignored her protests, Ishtar began to work with Emperor Arvis to secretly free the captured children. Soon afterwards, while she and Julius are in Conote, he comes down with a high fever. She becomes very worried about him and travels to Leonster Castle to ask Bishop Saias to cure Julius of his illness. Around this point in time, Julius begins to notice Reinhardt's romantic feelings for Ishtar, which makes him extremely jealous and furious. He orders Ishtar to remove Reinhardt from his status, which she reluctantly agrees to, although she also begs Julius not to kill him. Afterwards, Ishtar and Julius travels to Miletos, where Hilda is currently residing. Around this time, Ishtore and his lover, Liza, are killed by the Liberation Army led by Seliph, who soon recruits Tine/Linda into his army. While Bloom is saddened by both his son's death and his niece's betrayal, he summons Ishtar to Conote and begs her to protect him. Surprised by her father's panicking, Ishtar agrees to his pleas, but asks him to give her the Mjölnir before she leaves to fight the Liberation Army. Despite her immense magical power, Ishtar is defeated by the Liberation Army, but before she could die, Julius suddenly appears and rescues her. This ultimately leaves Bloom with no one to protect him, and he is soon slain by the Liberation Army. After recovering from her wounds, Ishtar is ordered by Julius to send the captured children to Belhalla Castle so that he could sacrifice them. She reluctantly obeys, and after his departure, Hilda reminds Ishtar that she is the best candidate for Julius's affections, urging her to marry him as soon as possible. Following this, she is commanded to travel to Miletos Castle and prepare the children to be sent to the capital. In Miletos, Emperor Arvis asks Ishtar to free the children. However, Julius soon appears and informs him that she serves only him while also commanding him to leave. After this, Julius informs Ishtar that the Liberation Army had come to Miletos and proposes for them to play a game in which the victor is the first person to successfully kill an enemy soldier. After either of them are defeated or kill someone, they leave the battlefield together and travel to Belhalla. In the Final Chapter, Ishtar learns that Hilda has been slain in battle against the Liberation Army, and as a result, she asks Julius for permission to lead the Weissen Ritter into battle. While he is reluctant at first, he agrees to it once she declares her love for him. Along with her, she takes the Falcon Knight sisters, Meng, Bleg, and Maybell. Ignoring Tine's pleas for her to stop fighting, Ishtar ultimately dies fighting against the Liberation Army. Ishtar has a complex personality and appears to be torn between duty and desire. Although she is a major antagonist, she is a kind and caring woman who is not cruel or ruthless in the least. Because of this, she is viewed positively by the people of the Friege region. Despite her undying loyalty to Julius, she is willing to defy his will behind his back, as seen when she helps the children who were captured in the child hunts. Despite her lack of personal disdain towards them, Ishtar remains persistent in fighting against Seliph. Her love for Julius and her family are major factors that prevent her from defecting to the Liberation Army, despite Tine's efforts to convince her. Abilities: The Black Knight is a swordsman, and wields the blade Alondite, which can attack from long distance. In addition, the Black Knight has armor that is impenetrable by weapons not blessed like Alondite or his armor, as well as Warp Powder, which allows him to teleport any distance at the cost of some of his energy. 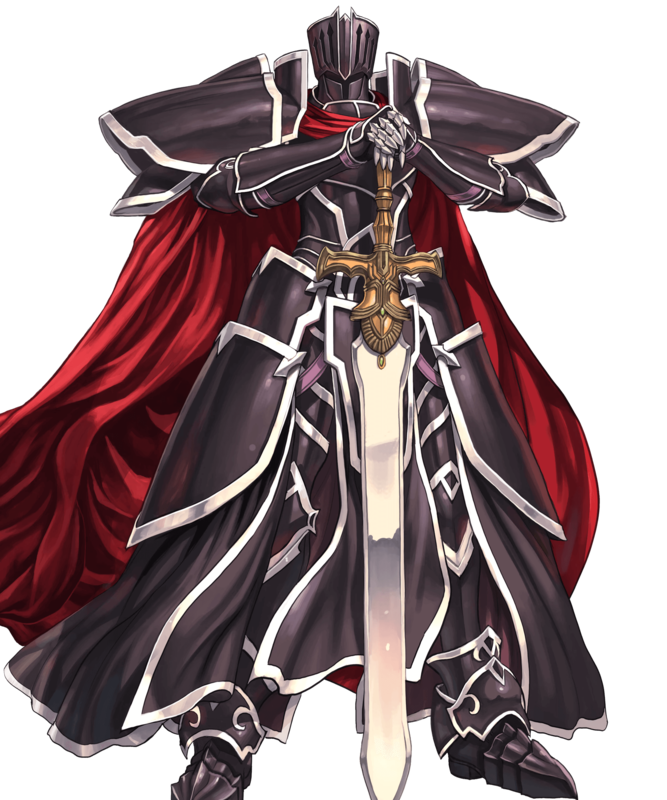 Bio: The Black Knight, is a boss character in both Fire Emblem: Path of Radiance and Fire Emblem: Radiant Dawn, though he is also playable in the latter. He was Daein's most powerful general during The Mad King's War, and a member of Daein's Four Riders. The Black Knight is defined by his mystery, always appearing encased in full armor, and not going by any formal name. His position as high general in Daein's army was due solely to his immense power and his chivalrous behavior toward Ashnard. When he appears, it is only to do the bidding of his master, and slay anyone who would get in the way. Nobody in Daein's army, not even Ashnard, knows what the Black Knight looks like under his armor. Apart from his duty as a soldier, the Black Knight appears to care only about mastering the art of swordsmanship, having pursued and slain Ike's father Greil for the specific purpose of surpassing his former mentor. Due to Greil's surprising failure to put up a solid fight, the Black Knight waits instead for Ike to become strong enough to oppose him, in hopes of being able to fight someone who could be seen as equal to Greil in his glory days. Ike clashes with The Black Knight many times throughout both Fire Emblem: Path of Radiance and Fire Emblem: Radiant Dawn, and eventually slays him in the Tower of Guidance after learning the Black Knight's true identity. He ends up dying in peace, having known that he contributed to the perfection of swordplay, and served his master to the very end. Weight (you can approximate):Enough to get the job done,thank you very much,good day sir. Abilities:Diamonds Droog has five weapon slots and one inventory slot, like the rest of the Midnight Crew. All of his items double as playing cards. His weapon of choice is the Ultra-Violence Cuestick, but he also keeps an array of firearms equipped. 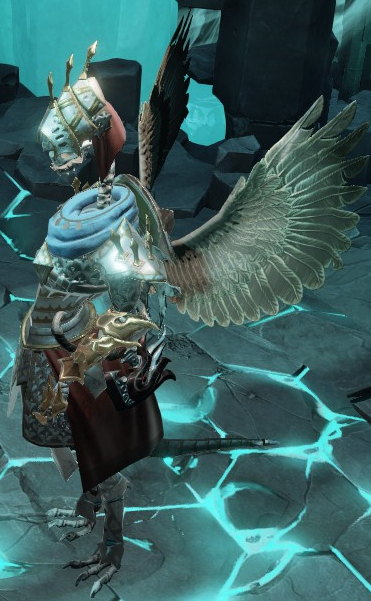 His inventory slot holds his Deck of Cards, which is also a Brawlsoleum. He considers this the most appropriate conveyance for his many Backup Hats and Finely Tailored Suits (it is not known why he doesn't instead use a Battledrobe like Clubs Deuce). The Brawlsoleum also contains additional weaponry, including a Sniper Rifle and several Pistols. He also keeps an issue of The Gray Ladies hidden in the Gazette. He keeps two Swedish Fish in one of his Backup Hats. The Felt's medic and tailor, Stitch, was previously imprisoned in the Brawlsoleum. This was appropriate, as Diamonds is a character who is "dressed to the nines". Diamonds has no supernatural abilities to speak of. However, his intelligence and perception, as well as his inability to be confused by silly things like time travel differences, make him incredibly savvy and very dangerous. Bio:Diamonds Droog was originally the Draconian Dignitary, an Agent of Derse in the trolls' session of Sgrub. He was exiled to Alternia during the course of the session, and eventually formed the Midnight Crew along with Jack Noir, the Courtyard Droll, and the Hegemonic Brute. Diamonds is the tall, intimidating-looking fellow of the Midnight Crew. He wears a suit similar to Hearts Boxcars, but he adds a tie as an accessory, which none of the other members wear. His hat is also easily identifiable as his, and the combination of these personal traits make him to appear to be quite vain, but that's totally justified because of how classy he is. He appears to have been part-inspired by the gang in Anthony Burgess' novel "A Clockwork Orange." The most noticeable references are his name, his weapon, and his general propensity for violence and lashing out when displeased. "Droog" is Russian ("друг" transliterated to Latin characters) for "friend", a callback to how diamonds are the symbol of moirallegiance, as well as the phrase "Diamonds are a girl's best friend". He is Aradia's exile, and the one that made her attack Vriska. He also briefly issued commandsSburb Logo to Tavros. His current fate is unknown, much like that of the rest of the Crew aside from Slick, as he was punched into next week by Cans and has not been seen since. However, it's presumed that he died along with the A2 universe. Alignment:Lawful Evil,he's not some uncultured hooligan after all. Height (you can approximate): 6'0"
Abilities: The Abomination has two different sets of abilities, which changes whenever he switches forms using Transform. Transforming into Beast form does not count as an action, allowing the Abomination to Transform and use another Skill on the same turn. Upon Transforming back into Human form, Transform cannot be used again for the duration of the battle. If the Abomination is in Beast form when a battle ends, he automatically transforms back to Human mode. Additionally, he will return to human mode if he suffers an Affliction while in beast form. In ordinary, human form, the Abomination is capable of flailing his manacles at individual opponents in-order to stun and injure them. He can also spew up toxic bile or rest in-order to restore his physical and mental wellbeing. In beast form, the Abomination can rake with his claws to attack multiple opponents: his damage output with Rake intensifies with each use. Otherwise, the Abomination is able to fly into a rage and viciously maul a single target, or he can charge forward and slam a melee-range opponent with his horns to knock them away. Being a beast can cause perilous stress to the Abomination if it lasts for too long. Outside of combat, the Abomination can calm friends via anger management (although it may cause him stress), psych himself up before battle in-order to make himself more violent, become faster, and become more resistant to poisonous effects and bleeding through his eldritch blood (this however can make him more irritable). In terms of equipment, the Abomination is reliant on his bestial mutation as a weapon and his chains as a form of armour. He has modest dodging abilities and is quite physically robust, sporting good survival abilities and a resistance to poison at the expense of being vulnerable to bleeding, diseases, traps and a few other debilitating effects. Bio: The Abomination is a vagrant escapee from what is best described as a religious torture tower. His blood is tainted with an eldritch poison, which is evidently the cause of his bestial abilities. As with the other heroes of the Darkest estate, his role is that of an expendable front-liner against the various eldritch horrors that lurk there. He has something of a sombre personality and often faces rejection at the hands of religious colleagues, though this can be of some benefit as he often vents his woes and hopelessness in combat. Abilities: Covet-Hiss' primary weapons are that of cannons, howitzers, blunderbusses and lasers, particularly ones that are multiple times his size. He is quite apt, being still able to manoeuvre about with one equipped. He can fire his oversized weapon of choice for defensive and offensive purposes: otherwise, he can use his special ability 'Double Ba-bam' by charging up and shooting. This releases two projectiles/blasts, which are considerably more powerful than usual, although the range of the shots is limited. His enormous weapon, however, limits him to only being able to equip hats and helmets. Covet-Hiss has a range of learned skills: Instacharge reduces his attack speed moderately, Body Piercing allows projectiles to pierce opponents and structures and Tainted will copy the poisonous effect of his most poisonous ally and incorporate it into his attacks. Covet-Hiss wields other skills, but can only slot in a few of them at once: Incinerate means that any fires he causes will become enormous, Gun Attack amplifies his damage output, Growem Green allows him to create grass with his attacks, Super Singe doubles his burn rate and Peerless Snake quadruples his poison rate when a critical attack is inflicted. Bio: In reality, Covet-Hiss is Sonarchy's father, King Ighl, one of the sole survivors of the ancient Ah-ooh dynasty that the Patapons invaded and destroyed a long time ago. They tried to use the Archfiends to exact revenge on the Patapons (which was somewhat unsuccessful). 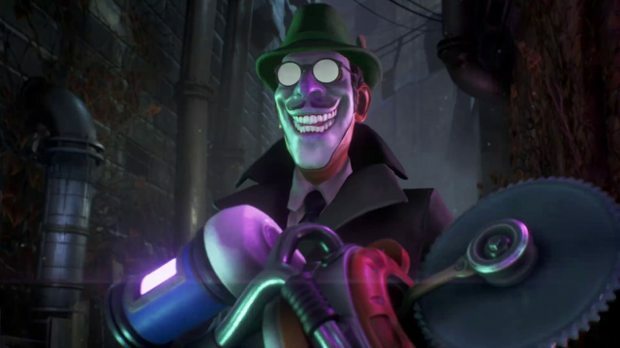 Miss Covet-Hiss has been shown in-game to view himself as a woman with conviction (as demonstrated how he asserts he is a 'big girl' and how he constantly refers to himself as a mother), but this is theorized to be a side-effect of the mask he wears. Sonarchy still calls him "Papa" though. However, worthy of note, perhaps, is when offering to afford exposition about the arena as seen in Mission 30: Dark Heroes' Last Stand, one of the available response options to Covet-Hiss is 'Yes, ma'am, please!'. While the reply made by Uberhero may have been in fact tongue-in-cheek, they are still referring to Covet-Hiss with a traditionally female term of respect. The ending cutscene featuring the Dark Heroes shows Covet-hiss revealing to Slogturtle and Buzzcrave their identities. He flies into a murderous rampage when he realizes that their memories have been restored without his permission. In the chaos, he attempted to kill the two Dark Heroes while Sonarchy threw himself in front of them and ordered them to escape. Sonarchy then, with no other choice, knocked him to the ground, dealing 777 critical damage points while telling his father that it was time for redemption. 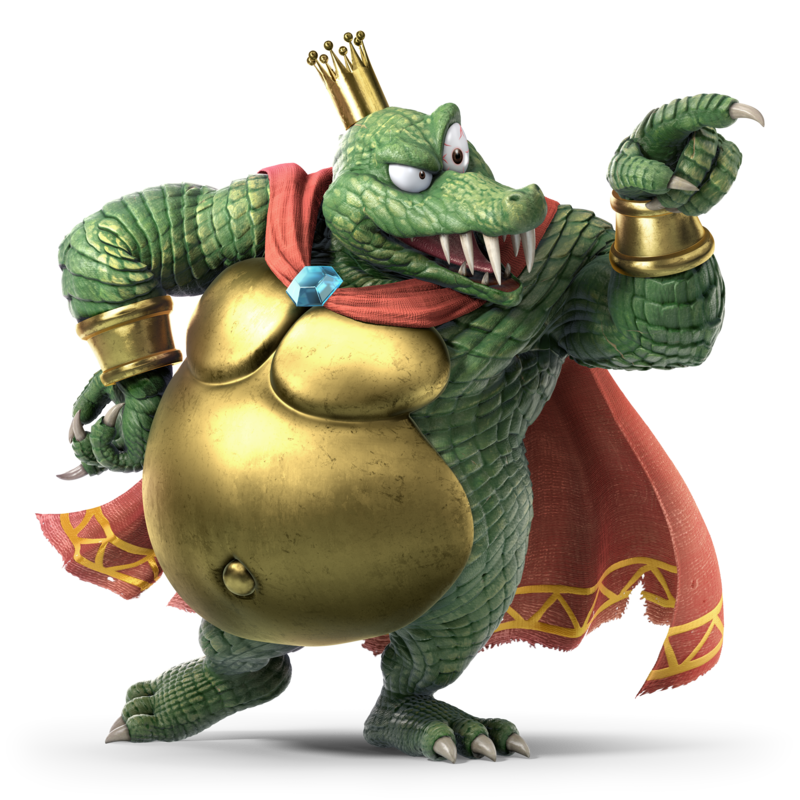 Height (you can approximate): 7'5"
Abilities: King K. Rool has immense strength and immense mass being an overweight but muscular Kremling, or an anthropomorphized crocodile. On top of this, his crown makes the top of his head, his weak point, impossible to strike while it's off; hitting any other part of his body would deliver significantly less damage due to his scaly hide and his multiple layers of fat. K. Rool also has access to hammerspace, in which he carries his blunderbuss, boxing gloves, and K. Rool Kopter. K. Rool's crown acts like a boomerang, but this also leaves his head vulnerable. Despite what his appearance may suggest, King K. Rool is very agile, able to swing and cling as he pleases. Bio: King K. Rool makes his first appearance in Donkey Kong Country as the game's main antagonist and the seventh and final boss. K. Rool and the Kremling Krew come to Donkey Kong Island to steal Donkey Kong's Banana Hoard. The Kremlings encountered little resistance, as the only person guarding them was Donkey Kong's friend, Diddy Kong, whom they kidnap into a DK Barrel, and then they steal DK's Bananas. Later, Cranky tells Donkey Kong that his hoard was stolen, and Donkey Kong starts his adventure. After the fake credits are done, King K. Rool jumps and tries to stomp on the Kongs by jumping in a straight line. King K. Rool, after being jumped on ten times, is defeated. The cast of the game appear and the real credits roll in DK's Tree House, or at Gangplank Galleon in the Game Boy Advance remake. In the latter, he also appears after the credits, where he forces Donkey, Diddy, Candy and Cranky Kong off the ship by threatening to blow up Kong Island with his onboard cannons, with Cranky then calling it a "cheap stunt", setting the story for the sequel. K. Rool, as his name, a pun on "cruel," may imply, is brutal, ruling his minions through threats and intimidation, often punishing them severely when they fail. Even his most powerful followers seem to fear his wrath, as displayed in Donkey Kong 64, when his subtle display of anger results in Army Dillo fainting on the spot, and Dogadon ends up begging for mercy over his failure when admitting how his wings ended up singed by the Kongs (although K. Rool seems more shocked than angry at the failure regarding the latter). He does not seem to respect his henchmen, the Kritters, much better either. In Mario Super Sluggers, he refers to brown Kritter as "the dirty under-belly of the Kremling Krew". Despite all of this, however, he and the Kritters have good chemistry with each other in Mario Super Sluggers and the trophy bios of Kalypso and Kludge show he respects her leadership skills and is intimidated by Kludge's temper. K. Rool is also somewhat of a dirty fighter. He fakes defeat, often collapsing in the middle of combat and making it seem like he has been defeated, only to rise seconds later and begin fighting again. According to Leigh Loveday (writer of the Donkey Kong Country series) on Rareware.com's former "scribes" column, K. Rool's motivation for stealing the banana hoard is either that he wants Donkey Kong to starve to death so that he can occupy his "cosy treehouse pad," or perhaps that he simply likes bananas. Abilities: Joy Doctors have an arsenal of uncanny devices and weapons on their person. Namely, they wield a Bonesaw as a weapon, which is capable of sawing through flesh and inflicting injury along with grenades that can cause different statuses (slowing targets, for instance). Other equipment includes a resurrection tool, which can bring allies back from the brink of death and unconsciousness by zapping them, and a plague-doctoresque mask which they can wear to protect themselves from hazardous gases. Doctors can be expected to wield other tools and items as-well, for instance syringes of Joy and/or syringes of anaesthetic. Joy is able to cause happiness and forgetfulness, although if somebody overdoses from long-term use or if they are not compatible, it can trigger fits of panic and grief. Likewise, most Doctors carry pills of Joy. Some Doctors can be looted for medical utilities such as bandages. In terms of abilities, a Doctor has an incredibly powerful sense of smell which can detect certain objects and types of people- to be particular, they can pick up if somebody is a Downer off of their Joy. This means that stealth or ingesting Joy is a priority when in the presence of one. Physically, they are of some strength and can withstand mild punishment before falling. Their strength also means that performing a take-down on one requires more skill, and that they can easily restrain people when in groups or facing somebody weaker than them. Doctors are also shown to be quite cunning, as they are quite well-organised and two of them were able to ambush Arthur Hastings and briefly take him as a test subject. Bio: Doctors are a faction of medical professionals, chemists, experimenters and Downer investigators in Wellington Wells. They have a rat-like demeanour, often walking with their backs bent, arms close and noses sniffing the air. Their headquarters building is the Wellington Health Institute, grounds which function as a container for citizens afflicted with the plague and a house for dubious, scientific activity that possibly has a slight amount of psychological torture involved. Doctor Anton Verloc, the main Joy manufacturer, seems to have authority over the Doctors as one is concerned that the man might not like them looting all of the evidence from a reporter's house and another seems concerned about Sally Boyle's visit aggravating him. While Doctors are quite intelligent and well-spoken, they are very controlling and will go to any measure to cure or get rid of Downers, even if the means are invasive, cruel or murderous. They are determined to have their way and enforce Joy upon citizens, although unlike Bobbies they will submit and beg for their life as would regular Wellies if on the brink of death. Doctor Shelley is your typical Joy Doctor, a delightfully friendly person as-long as you're on your Joy. Attikus wears a white collared undershirt, with black suspenders,over that he wears a tan tweed jacket,over that he wears a dark cloak(modified of course for his extra arms), he wears a pith helmet with a rather large bill to keep his eyes in the shadows, he wears no shoes,his skin is a dark brown and grey pattern, the claws on his hands fold over his 'palms' while the claws on his 'feet' are out like toes. He has a polite Gentlemanly demeanor,when addressing and when addressed, and a calm natured all around, only when excited does his voice gets lower in pitch, he's rarely phased by something unsettling or scary that others might find that way, do to being quite used to terrifying things. Abilities:Attikus can speak lower Arachnid(common spider) to a degree as well as english, crude ASL,Higher Arachind, and some gibberish, He has two powerful fangs, that he often keeps folded in, these(considering his size) can flood the body with dangerous venom, he has seven arms(one was lost in a romantic venture with a mantis) that he can manevaur quite well, his hat blocks out the sunlight from his eyes,while the cloak he wears is a dark ebony allowing him to blend into shadows, he carries what appears to be a small plastic grabbing toy, with a large eel like 'grabber' head,this is actually animate, and can unfurl its teeth to bite down when jabbed at by Attikus, Attikus is covered by an exoskeleton, which is somewhat harder to pierce than human skin, this itself is covered by chitinous hairs, that are quite sensitive(the most sensitive being located at the end of his hands), he can spin silk but he would rather not finding it the human equivalent of dropping your trousers and exposing yourself,Attikus is quite well mannered, though it is apparent in the way he talks that he's not to aware of how accidentally unsettling he can appear to others, he cannot see very well somewhat nearsighted, as this usually ends up with him trying to get closer to see who or what a person is. Bio:Attikus Cobbwebs started off a life as a normal Wolf Spider,however due to his nature as a being of the realm of dreams he changed overtime, he grew quite bored of the savage and dangerous, yet simple life of a common spider,though he hunted and hid,he longed for a more organized, varied way of living, observing other beings, Attikus began to become civilized, learning languages, proper communication,social graces,mental fortitude,as he grew in knowledge his body went through restructuring in response becoming more 'humanoid' in appearance, standing upright on his hind legs, his head restructuring to be on the top of his torso looking forward his foreclaws became more like crude fingers, able to pick things up and maneuver them to a degree. Attikus Cobbwebs had come into existence,he spend many years exploring the never ending world of Imagination,making friends,lovers ,and the odd foe here and there, it was only during a visit to the town of Gristle(A town made of the dried flesh,sinew,and bone) where he stumbled upon a large nightmarish creature that was a spider in man's flesh, Attikus was both delighted by the creature's appearence and impressed by its ability to cling to structures and ability move at a chillingly fast pace,he thought it rather neat a Man shaped spider and a spider shaped man, such a neat pair they could make! Description/Picture:A spider(think tarantula), but with fingers as legs(the thumbs acting as the pedipalps on the body) covered with pale skin, and coarse hair, with a makeshift saddle on top of his(back), has six eyes scattered around his head(two brown three blue, one green), all appearing to be lazy until they zero in on something that catches their attention, a large mouth contain two over sized upper canines jutting out like tusks, tips of 'legs' are deeply calloused and tipped with a harded sharp nail, back end contains what appears to be a spinneret that can make hair. Any good Clash needs a hero amongst all of the helpless innocents and wrongdoers, so I have decided to introduce the right man for the case. Height (Like a beast! ): 6'5"
Abilities: Callum's main abilities are his fighting techniques, such as his spinning elbow among many other (tic) tactics. He is versed in fighting smaller people, larger people and groups of people. In-addition to this he is familiar with looking after babies and not acting inappropriately as a member of the male species. Callum works in care, and as such is capable of catering to people effectively and not being fazed by most otherwise disgusting sights. He is quite intelligent and questioning, able to see past deceptions that might catch out a lesser male. In-addition to this, his fierce temper combines with his physical prowess to turn him into a dangerous opponent. He is quite good at elocution too, swift with his words and fast of wit. Callum's only weakness is that his rage can get the better of him. 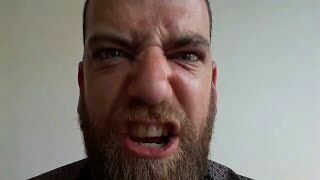 Bio: Callum Adams, better known online as Callums (sic) Corner, is a British video blogging channel, which became an internet sensation in 2016 after he published an angry video threatening people who said his head looked like a Tic-Tac. His most popular video is "MY HEAD DOES NOT LOOK LIKE A SODDING TIC TAC. A FINAL WARNING", which was posted on the 20th of July, 2016. On the 22nd of October, 2016, Callum uploaded a video titled "My head does look like a sodding tic tac. You win, I give up" where he confessed that his head resembled a Tic-Tac. Callum created an alternate channel called "Tic Talks" on the 16th of November, 2016, shortly after his video "My head does look like a sodding tic tac. You win, I give up" was created. Height (you can approximate): 6'8"
Abilities: Ole Marrowe benefits from being undead in a variety of ways: she is able to recover and heal via poisonous chemicals and pick locks with her bone fingers. Being undead does however come with disadvantages, such as most normal forms of healing causing deterioration and the frightful appearance being able to disturb certain (well, most) people. One underhanded tactic she can use thanks to being a skeleton is playing dead in-order to deter or fool opponents. In terms of skills, Ole Marrowe has honed her thieving powers to an exceptional degree, specialising in breaking locks and pick-pocketing copious amounts of goods rather discretely. However, all of the time spent learning this has left her with little time to practice skills like negotiation, bartering and studying. Otherwise, Ole Marrowe possesses a range of abilities related to polymorphing, for instance creating extraneous limbs like wings and tentacles along with covering herself in sheets of invisible cloak or metal. These are not at-all limited to herself either, as she has mastered transforming the physically unprotected into chickens. In-addition to polymorphing, Marrowe is equipped with necromantic abilities that enable her to raise detonationable, bloated slimes from corpses, create shackles that will share the harm she experiences with a victim and amplify the strength of an ally or herself based on how close they are to the brink of death. As a combatant, Marrowe traditionally wields a large blade of some description along with a shield, or alternatively one single two-handed weapon. She generally robs weapons and will always steal the next thing that looks like a substantially dangerous bludgeon or shield. This same principle goes for armour and she will make sure that by any means, however dishonourable those might be, that she is covered in a thicket of metal sheets and leather. As you may expect, Marrowe is quite a brutal and cheating combatant. Along with her plethora of other duplicitous and dirty tactics/abilities, she wields an uncanny amount of physical strength, precision and speed for a walking corpse. Marrowe can also sneak and vanish if not kept a careful eye on in the field of war. Despite not having any glands, she can use adrenaline to perform bursts of attacks (although she will be left exhausted afterwards). Two of her special warfare tactics are to swing her weapon in a circle around her along with barging violently into an opponent as a means to knock them over and incapacitate them. Bio: Ole Marrowe, as she enjoys being called, is the sole leftovers of a decadent Lizard slave trader, noblewoman and military commander. After being exported to Fort Joy as a prisoner, she became involved in a range of violent criminal murders, activities and thefts before escaping to the rest of the island and succeeding in accomplishing yet more thefts on a camp of escaped refugees. She later discovered Bishop Alexander and a band of other members of the Divine Order, who she rather unfairly killed/maimed by gassing them with a barrel of Deathfog. Malady would later bring her onto the ship the Lady Vengeance, a sentient woodwork vessel which Marrowe could not resist condemning to a lifetime of slavery and obedient misery to herself. After arriving upon Reaper's Coast, Marrowe offered to assist a man recover his wedding ring from the shores. She was promptly torn apart by a pack of vicious sea monsters and never saw the light of day again. It is probably an understatement to say that things are better off without her, but she seems to already be making a recovery.